Robert currently holds the position of Deputy Chief. In the past, He has held the positions of 1st Assistant Chief, 1st Lieutenant of Rescue, 2nd Assistant Chief, 2nd Assistant Engineer, 2nd Lieutenant of Rescue, Dive Team Coordinator, and Rescue Captain. . Rob has been an active member since 1989 and starting out as a Junior Firefighter and holding various Fire Line Offices during his time. 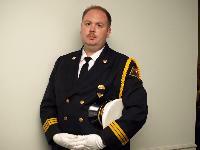 Rob is a Past Director with the New Castle County Fire Chiefs Association serving the 2010-2011 term, Chairman of the Website Committee, Information Technology Committee, and Co-Chair of the Membership Committee. Rob has several training classes from the Delaware State Fire School and has completed sequential training to obtain the Pro Board Fire Instructor II certification and a Nationally Registered EMT-B. Rob is also a certified Public Safety Diver. Rob is currently employed with the New Castle County Public Safety, Communications Division and with Red Storm Fire and Rescue Apparatus as the Regional Sales Representative for the State of Delaware.